After the snooze-fest that was yesterday’s Hungarian Grand Prix, I couldn’t really bring myself to write a review of it. Hungary has always been a dull circuit; even the addition of KERS, DRS and Pirelli tyres fail to make it exciting. Given it was built in only 8 months (fun fact #1) I guess the Soviet Bloc didn’t really have time to add “fun” to the mix. I was hoping for a rare wet race – it took 20 years before the first happened at the Hungaroring in 2006 (fun fact #2) – but it wasn’t forthcoming. Get asked to write a review of the Hungarian Grand Prix. Don’t really want to, I’m still tired from doing 1,000 words on the Olympic Opening Ceremony for the Guardian. Plus, it’s a Sunday. Hamilton on pole, expect a fast start from Grosjean though. Decide to go outside and play with my new ball. Sniffed around the fence looking for next door’s terrier. Not there. Roll in something that’s probably going to make me smell bad and get shouted at. Go back into the house, hear something about Schumacher stalling on the grid. Hah. He’s too old. Buried my new bone, dug it up. Buried it again in the best hiding place ever. Forget where new hiding place is. Bark at a seagull for flying over my garden. It goes away. Hah, loser. Over hear something inside about pit stops and Hamilton having a slow tyre change. Feeling a bit hot, went to get a drink. Back outside, decide to bark at a car going down the street. Sunbathe for a little while until I get too hot. Roll onto other side to warm that instead. Start barking for no apparent reason, get told to be quiet. 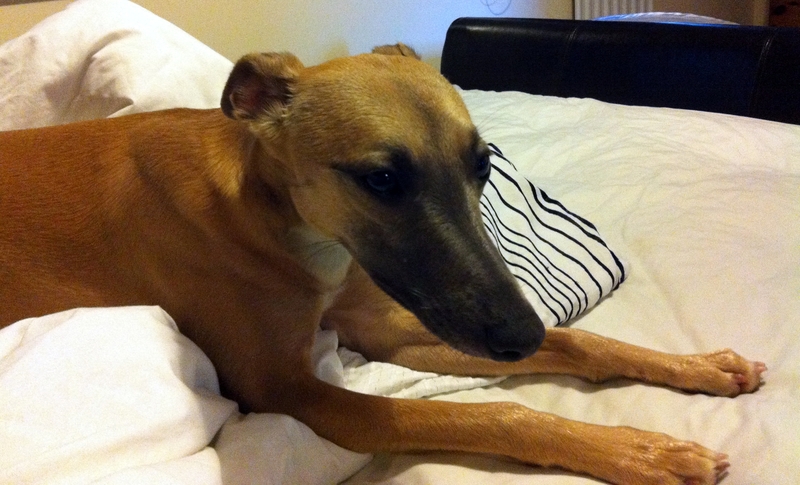 Go inside and lie on the sofa, race still looks boring so go back outside after a minute or two. TV mentions something about Button switching to “Plan-B”. Didn’t think a F1 car had a CD-changer. Get made to pose in front of TV for picture. Knock something over outside, scare self in the process. Dig up some gravel from around the patio, wondering if new bone is underneath. It isn’t. Dig up the rest just to be sure. Decide to check if bone has made its way inside. Raikkonen comes out the pits and almost hits Grosjean. Hide behind the sofa as people get overly excited. Mclaren make a mess of another pit stop, this time for Button. Maldonado hits another car, di Resta this time. Think he needs to go to obedience classes. Barking dog outside might be important, head to the garden. Dog barking is one from across the street. Dislike that dog, staring at me from its window. Pah. Hear owner loudly making some joke about Kimi and ice cream. Don’t really understand to be honest. Think about going behind the shed but remember getting stuck once before. Need another drink, Schumacher retires. Not for good, just from the race. Though he probably should give up, he’s never going to win anything. Hear laughter as Narain Karthikeyan retires after hitting the barrier. Worst. F1 Driver. Ever. I could do better, and I don’t even have opposable thumbs. Raikkonen doesn’t manage to pass Lewis who takes the win. 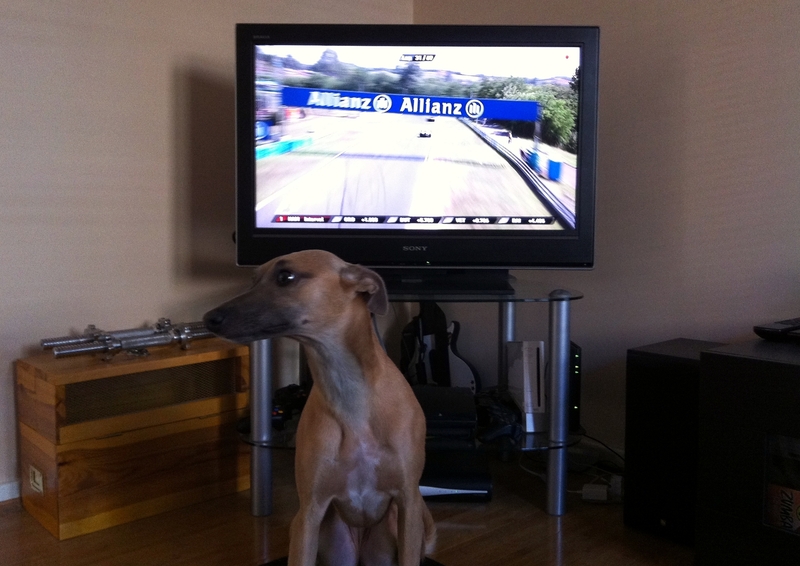 Get told off for barking at TV when Lewis gets out of his car. Don’t like him. Happy that Bruno got points for coming seventh, though confusing to hear all this talk of Senna doing well. He should really change his name. 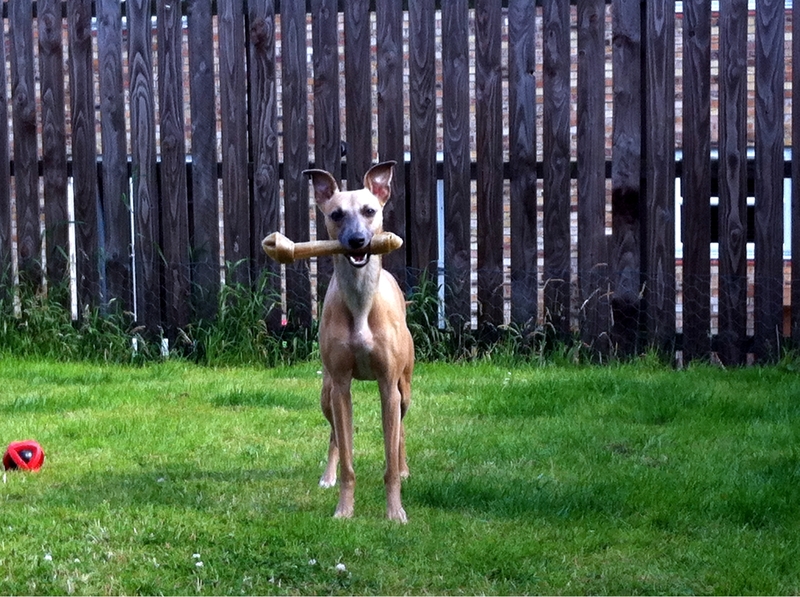 Run back outside and finally find new bone. Happy. Forget about boring Grand Prix. And that pretty much sums up the 2012 Hungarian Grand Prix. It does strike me as odd that Hungary remains on the F1 calendar, given the raft of new races wanting to get their share of the action. I realise it probably attracts a lot of fans from Eastern Europe, but that can’t be enough for Bernie surely? Either way, F1 takes it’s summer holiday now until the rather more exciting Belgian Grand Prix at Spa on the second of September. Hopefully a certain dog won’t need to be called in to review that one.